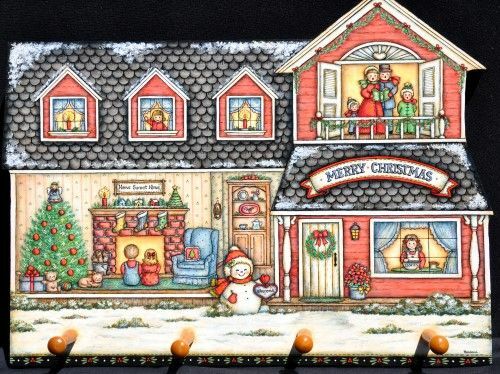 Featuring a Christmas house with lots of small details. A little girl peeking out a window, carolers, children and a cat by a fireplace, girl baking cookies, and a snowman outside. It is painted on a wooden house shaped plaque measuring 10” x 131/4” with 4 wooden pegs. This pattern may be enlarged and painted on canvas or watercolor paper. This e-packet contains: Complete directions, four color photos and three pattern pages for a total of 9 pages.